Black-Eyed Susan plants are valued as long-blooming perennials, putting out numerous flowers non-stop for most of the summer and into early autumn. The cheerful flowers consist of golden petals that radiate from a dark cone (thus the common name, even though the color is more of a dark brown). Small hairs cover the stems and leaves, accounting for the specific epithet, hirta (Latin for “hairy”; think “hirsute”). When in bloom, Black-Eyed Susan plants stand 2 to 3 feet tall, with a spread of up to 2 feet. It is difficult to say if the best feature of these plants is the abundance of their flowers or the fact that they bloom for such a long time. Plant Black-Eyed Susans in a corner of your garden, and for half of the growing season, you’re sure to have color there. A perfect plant for native perennial sun gardens. This member of the aster family can be grown in planting zones 4 to 9. Indigenous to North America, they are native to or have become naturalized in wide swaths of territory across the U.S. Plant in full sun (or partial sun in the South) and in a soil of average fertility. Plants will spread more in a friable soil than in clay (which may or may not be desirable). These cheerful plants are drought-tolerant perennials once established but perform better if watered during dry spells. Black-Eyed Susan plants are susceptible to powdery mildew. 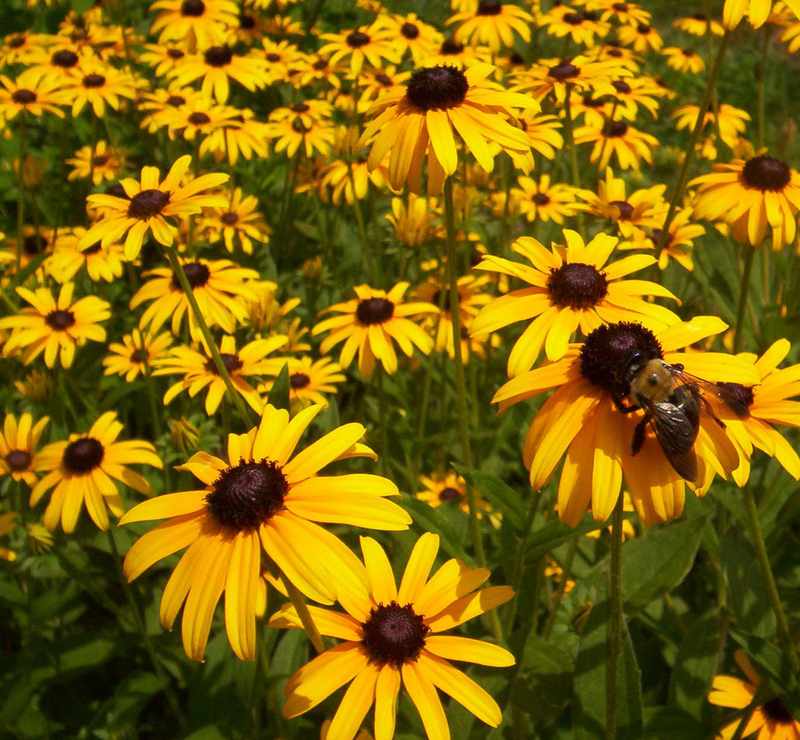 To prevent an infestation, keep your Rudbeckia flowers thinned out. If the powdery mildew is already present, treat with a fungicide. Black-Eyed Susan flowers can also profit from deadheading. To propagate and/or rejuvenate, divide in spring. Rudbeckia flowers are sometimes referred to as “coneflowers,” but that common name is more typically applied to Echinacea, which includes the coneflowers such as the old standby, purple coneflower (Echinacea purpurea) and newer types. Black-Eyed Susans are often massed together in perennial borders and are effective at erosion control. Like ‘Becky’ shasta daisies, they also make very nice cut flowers that can last up to 10 days in a vase. Popular in wildflower gardens, this is one type of wildflower that almost everyone knows, even non-plant lovers. They attract birds and butterflies. 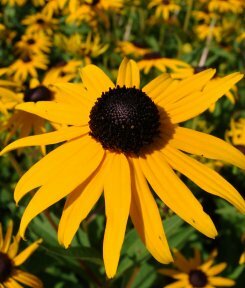 The roots of Rudbeckia have been used much like the related Echinacea purpurea to boost immunity and fight colds, flu and infections. It has also been used as a diuretic, an astringent for sores and swellings, a poultice for snake bites and to make an infusion for treating colds and worms. Juice from the roots has been used as drops for earaches. Certain parts of the plant contains anthocyanins a class of antioxidant with several known health benefits. However, as with any wild plant, it is usually recommended to research carefully before consuming, as not all parts of the plant may be edible and to avoid mis-identification with other plants that may look similar. It is also recommended to consult one’s doctor before taking any medicinal herb; dosages and preparation procedures should always be strictly followed. Rudbeckia is also known to be toxic to cats when ingested.